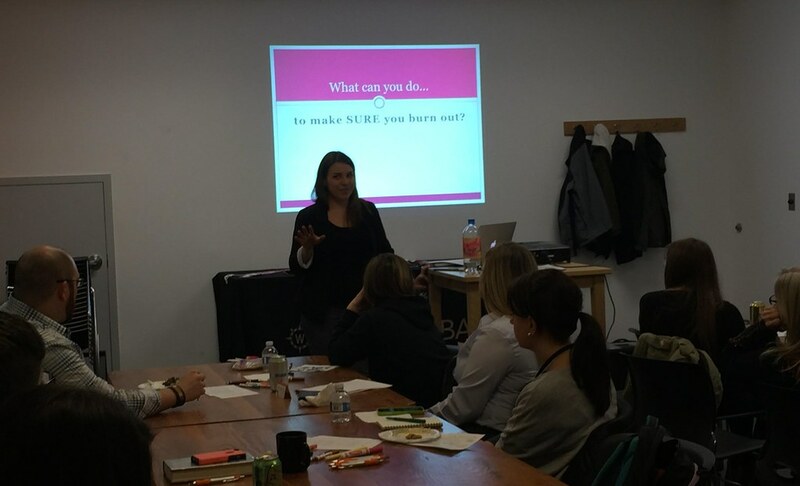 Britt Stetson, a long-time volunteer and board member of YNPN Portland, gave a heart-felt presentation on self-care practices at Hatch Innovation Lab last Wednesday. Around 30 non-profit and for-profit professionals came out to learn how to better care for themselves in careers that are rewarding but also demanding and high-stress. Retelling tales of a more hectic and self-care lacking time in her life, Britt's anecdotal stories brought smiles and illustrated common situations that developing professionals face daily, yearly, and throughout their career. We'll be talking self-care at our next event on February 10th. (Sold out, but there's a waitlist!) Check out these resources for some pre-event inspiration. Your self-care may be holding you back and making people around you hate your guts from Nonprofit with Balls. 3 Ways to Deal with Burnout in Your Career from Mac's List. Working for social change? Make self-care a priority from Idealist Careers. The Importance of Self-Care, a TED Talks playlist. What are your favorite resources when it comes to self-care? Let us know on Twitter. "Everybody can be great because everybody can serve." - Dr. Martin Luther King Jr.
To celebrate the legacy of Dr. Martin Luther King, Jr., YNPN Portland partnered with Hands on Greater Portland and United Way of the Columbia-Willamette to participate in the Living Cully Cleanup. More than 50 volunteers gathered in the Cully neighborhood to transform a set of buildings from adult entertainment stores to a plaza that will benefit the community. The plaza is being renovated by Living Cully, an innovative collaboration between four non-profit organizations in the Cully neighborhood - Habitat for Humanity, Verde, Hacienda CDC, and the Native American Youth and Family Center. Time for a new Board Member Spotlight! Learn about our Board Chair, Megan O'Leary. I'm the new Director of Membership Services at the Oregon Entrepreneurs Network, a statewide membership organization connecting entrepreneurs to a network of peers and mentors, startup funding opportunities, and hands-on training. Note: This is a 3-part series. Catch up on parts 1 and 2. In July 2015, we sought answers to that “what’s next” question with our Leveling Up professional development event. How does someone with a few years under their belt leverage their connections, skills and experience into their next great role? We gathered for an evening of answers, ideas, and discussion with Jackie Hanselmann Sergi and Melanie Damm of Koya Leadership Partners, a national executive search firm dedicated to placing exceptionally talented leadership at nonprofit organizations. Jackie and Melanie gave us a better understanding of how to position ourselves for success, and the next step in the career of our dreams. Check out our Storify for a tweet-by-tweet recap. After the event, we realized we still had so many questions! We followed up with with Melanie and Jackie who were gracious enough to answer a few lingering questions. In fact, we got such fantastic information, we’re creating a 3-part blog series out of it. Welcome to Part 2! Note: This is a 3-part series. Catch up on part 1. After the event, we realized we still had so many questions! We followed up with with Melanie and Jackie who were gracious enough to answer a few lingering questions. In fact, we got such fantastic information, we’re creating a 3-part blog series out of it. Welcome to Part 1! Tell us what you do: I work at the nonprofit idealist.org as the Grad Fair Manager. I’m responsible for planning and logistics to help connect civic-minded individuals with graduate degree programs to further their work in the public sector. My work culminates by bringing together thousands of individuals and hundreds of grad school representatives together at an Idealist Grad Fair. In the fall I embark on a cross-country tour bringing the fairs to 10 different cities.